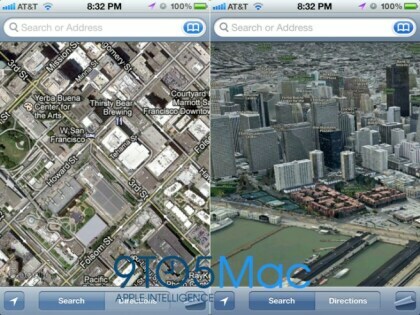 For the upcoming version of Apples mobile operating system iOS 6, the American company will not use Google Maps further more. Few weeks before the annual apple developer conference rumours appear that Apple will introduce their own map service to the public during this event. Information about this announcement can be read from an article of the US-Portal 9to5Mac. The article by 9to5mac refers to sources which has a relation to Apple. It is not expected that their will be major differences to actual map service provides like Google Maps or Microsoft Bing maps. The design should be more clearer and simplified in comparison to current map applications. In the standard settings the 3D mode will be deactivated, but can be activated using a 3D-button. Even if these are in official information it is very likely that Apple will start their own service based on OpenStreetMap data. In previous times Apple has purchased several companies with expertise within this areas, such as Poly9, Placebase and C3 Technologies.